I really wanted to go to the Love Food Festival in Bath this morning. Unfortunately, being a mum of a small toddler doesn't make trips like this easy. I know there are plenty of parents who manage all kinds of extreme activities with their under two offspring, but I have a feeling that they have placid children like the 'immaculate ladies' (more on them another day) rather than a tearaway like Miss A. She's at that awkward age where she doesn't like to be in her buggy but she doesn't want to walk either. And when she does walk, she generally wants to go in the opposite direction and once she exceeds the length of the reins on her Little Life Backpack, she will throw herself to the floor and have the mother of all tantrums unless you pick her up and carry her. She's really tall (and consequently heavy) for her age and it's not easy juggling a three foot toddler and trying to shop at the same time. 'But you have a husband!' I hear you cry. Yes, I do. But as he does two days childcare in the week to generously(!) allow me to work full time, he sees weekends as his own time and will only join us on a day out if it's something that interests him. Food, as you may know if you've read other post, does not interest him in the slightest. In the end, it took three hours to get Miss A dressed and out of the door by which time we were heading into that dangerous territory of her needing lunch at midday and a nap at 1.30pm. I had things to do during her nap this afternoon so didn't want to risk her sleeping in the car on the way home, leaving me with no free time to iron in peace. 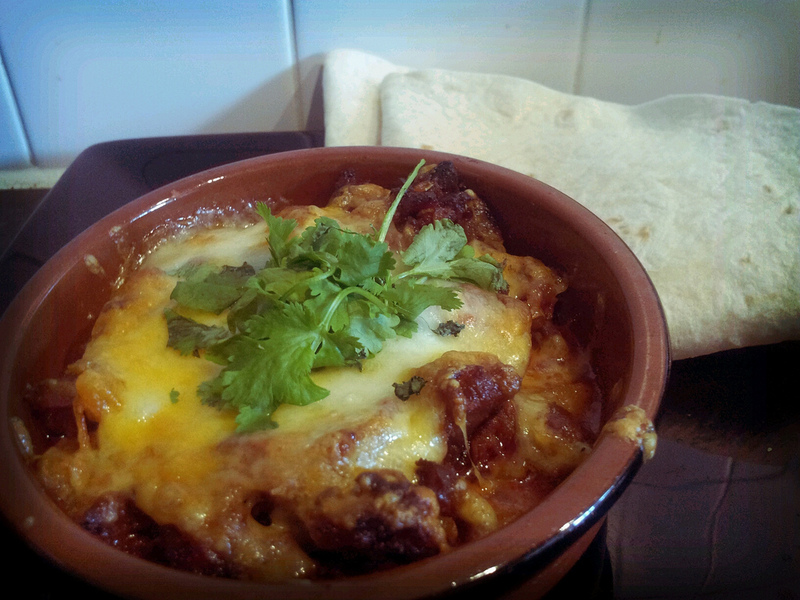 Melted cheese and chorizo. Top nosh! So my plans to buy something interesting to cook with today went south. Having got into a bit of a 'Life's unfair jag' this morning (it's a bit whiney, I won't take you there), I needed something to cheer me up for lunch so I thumbed through Mexican Food Made Easy and happened across Queso Fundido. Spanish for melted cheese. Miers says it's a bit like Welsh Rarebit. I would liken it more to the tastiest ever pizza topping, without all that horrible stodgy bread base (I don't like pizza - unless it's that gorgeous thin and crispy base you get from a wood-fired oven). Really simple, really tasty. What more could you want? I didn't have any salad to hand (save for some insipid iceberg) so I just put a sprinkling of fresh coriander on the top. I really *love* this book. It's in my top three favourites along with Dan Lepard and Lorraine Pascale. Preheat the oven to 180°C/350°F/gas 4. Cover the tomatoes with boiling water and leave for 20 seconds. Drain and pierce them with a knife so you can peel them easily. Scoop out the seeds and dice the flesh into small cubes. Heat the oil in a heavy-bottomed saucepan and brown the chorizo over a medium heat, breaking it up with a spoon as you go. Add the onion and cumin and cook for 5-10 minutes or until the onion is translucent. Add the tomatoes and cook until most of the moisture has evaporated from the pan and you have a mince-like texture. Season. Spread the mixture on to the bottom of a gratin dish so that is just covers the bottom. Cover with the grated cheeses and put in the oven for about 10 minutes until the cheese is melted and bubbling. Or you can stick it under the grill. Warm your tortillas in a hot dry frying pan for a few seconds on each side. Spoon some Queso fundido and salad on your tortilla and roll them up to eat.